is 100% GPL licensed accessibility-ready WordPress theme ideal for presenting your business portfolio in modern and unique style. Beautiful WooCommerce plugin integration also ensures the most pleasurable experience for your e-shop site customers. If you want a fast loading, accessible, SEO and mobile devices optimized theme, then have a look at the demo and see for yourself why Icelander is the WordPress theme you have been looking for! Speed optimized code – with honest performance grade of 97, without using any CDN and caching plugin! Having worked with famous templates like Avada, Salient, Flatsome and others, at first I was skeptical. But I found very easy to work with the Beaver Builder, and the thing I liked most was Oliver’s support. He has a lot of knowledge about accessibility and is very helpful. I could only choose 1 main reason for this review from dropdown, sadly, because other then the fantastic support I would choose also: Documentation Quality, Code Quality, Design, Customizability. It’s hard to select just one reason. The Customer Support is also the best, just like other elements like the theme’s Customizability or Flexibility. Great job!!! This theme is very well designed and modern looking. I am amazed about the customer support service provided. It is the best written electronic support that I’ve ever encountered throughout years of electronic purchases. I can conclude that WebMan Design is truly committed to give the best user experience. 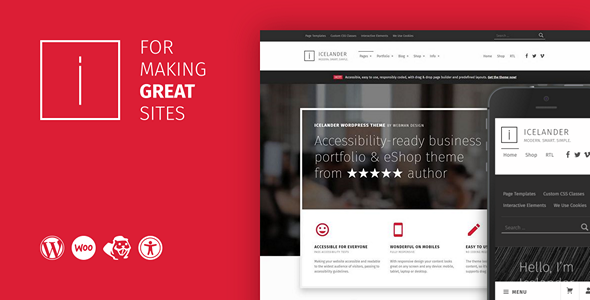 A well-coded perfectly validated WordPress theme that is fully accessible and nicely designed. Very lightweight and fast to install. Great customer service. Everything works. Awesome flexible design. No problem when installing any other plugins. Detailed documentation. Highly recommended. So good, that I’m looking at buying your other themes! More than an amazing, flexible theme, it’s the best support! Please check the theme documentation (user manual) before submitting any support ticket. In case you can’t find the answer in theme documentation, feel free to to ask (or search for the answer) at the dedicated support center. Please see the changelog.md file inside the theme folder for more info on theme update changes. Hi, I’m Oliver. A passionate developer striving for simplicity and doing things right in my products at WebManDesign.eu. I build both free and paid WordPress themes and plugins which are used by thousands of happy customers around the world. Thank you for your interest in Icelander accessible WordPress theme!